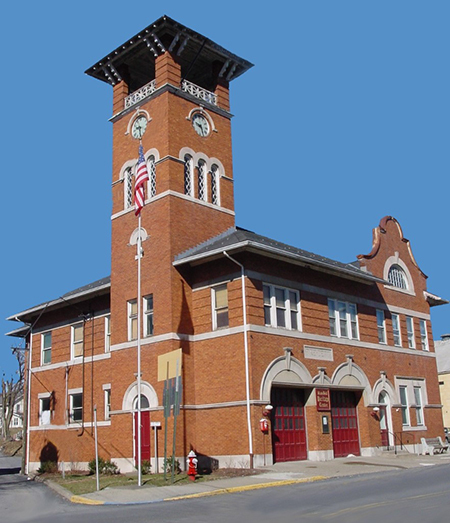 The Slate Belt Heritage Center was built in 1907 and originally served as the town hall, council chambers, borough offices, and fire department for the town of Bangor, Pennsylvania. In 1998, a group of determined citizens decided to save the deteriorating building and use it to house local heritage. In February 1999, the Bangor Town Council was approached regarding leasing this historic structure in order to restore it to its original state. Many volunteers enthusiastically began the arduous task of refurbishing the center from its hardwood floors to the tower housing the old town clock. One of the highlights is a mural that covers the entire wall of the staircase painted by art students from Bangor High School depicting the history of Bangor from its beginning to the end of the 20th century. In 2000, the Slate Belt Heritage Center opened its doors to the public in order to serve as a tribute to the early Slate Belt settlers and showcase their unique blend of ethnic cultures. The center contains two floors of self-guided exhibits. © 2015 SlateBeltHeritage.com. All rights reserved.|Maintained by ER Tech. Inc.